Why raise desperately needed transportation funds for a broke region when you could let people drive for free? In Georgia, the state has made up its mind: The DOT will pay $4.5 million to tear down tolls on GA 400 — and forfeit the $21 million a year the tolls brought in. It costs just 50 cents to drive 54 miles north and east from the city of Atlanta on GA 400. But last July — just before voters in the region rejected an effort to fund a multi-modal transportation package — Gov. Nathan Deal announced that the bond debt was paid off and tolls would be removed this fall. It’s extraordinarily difficult to implement tolling on a road that had been free. On roads that receive federal funds, federal law prohibits tolling except for new construction. And politicians never want to ask drivers to pay for what they’re used to getting for free. So Georgia is for all intents and purposes foreclosing the possibility of having GA 400 users pay for the maintenance and upkeep of the road they drive on. The state could also use those toll revenues for other projects that could take traffic off GA 400 and other roads, and reduce the pressure to build new highways in the future. The tolls have paid for express bus service along GA 400 and for a pedestrian bridge, among other projects, but there’s so much more that money could do. MARTA’s red line runs right down the middle of GA 400 in places — and although the charge to drive on GA 400 is disappearing, “the fare on the MARTA line is definitely not going away,” Emory said. The state tollway authority estimates average weekday traffic at 120,000 drivers, and the road, even with the toll, is often congested. Now the Associated Press reports that the Georgia DOT is predicting a “traffic spike” on the road — an additional 11,000 vehicles a day. 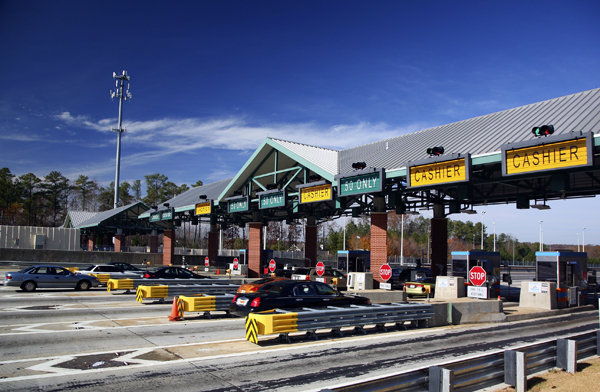 Even federal tolling bans relax for congestion mitigation efforts to price roads. If the 50-cent toll has been keeping 11,000 cars off the road — and it’s still a congested highway — why not call the toll a congestion charge and keep it? “It cost drivers just 50 cents each to drive 54 miles north and east from the city of Atlanta on GA 400. ” No, it didn’t. It cost 50 cents to drive the 3.6 miles between Lenox Rd. and Johnson Ferry Rd. There was only one toll booth, and it was between these two exits. I grew up in suburban Atlanta, where I had no option but to drive pretty much everywhere, usually in bad traffic. I moved away for college and have no plans to return. Stories like this make me glad to live in a place that is actively working to make it easier to walk, bike, and take transit around the city. Georgia seems to frequently be doing the exact opposite. The only time that will ever happen is if The Walking Dead comes true. “It ended up being a losing strategy,” Emory said. Seems it was a losing strategy from the start. Lol. One of the funniest things I have heard all day. Atlanta suburbs have each created their own individual Bus systems so they can make them as convoluted and inconvenient as possible so “those” people cannot move in. The blue states need to stop funding Georgia and others. The combined 85 & 75 road is “the connector”. Exactly, it’s rabid that tolls are seen as no different from taxes. When the bond is paid off, end the tolls. Plus a lot of money is saved because we don’t need to hire those toll-takers. So sad… And stupid to think Georgians would approve the tax *after* the toll had been removed. If they wanted to use the toll removal to encourage the tax approval, then they would have been explicitly tied together *on* the ballot! Money for maintaining the road will have to come from somewhere. Might as well come from the people who use the road. It’s easy to underestimate how costly it is to upkeep the pavement of a highway. There might, or might not, be a reason to charge tolls for maintenance of the highway. However, if a given tax/fee was imposed with some specific purpose (such as paying off construction bonds), it should be extended “just because”… has the bond been paid off? Remove toll charges. Then, start a discussion about other forms of tolling. That is already the case, since the tolls paid only for the bonds, not for maintenance. I even think they should charge tolls for maintenance, but this specific toll charge was enacted to pay a bond and when the bond is paid, the fee should be dropped. Politicians always pander to drivers, and telling them they’ll save the 50 cent toll is a great way to pander, even if it causes slower commutes and worse congestion. As the article says, it’s extraordinarily difficult to restore a toll that has been removed. The discussion must come before, not after, the toll is removed. The GA 400 toll was approved by the voters 20 years ago on the promise that once the construction bonds were repaid, the toll would be removed. The state tried to keep the toll in place even though the bonds were paid off, but there was a huge public backlash as the public reacted to the breaking of the promise made when the toll was put in place. The distrust caused by that action played a large role in the defeat of the T-SPLOST tax initiative since the voters felt like they could not trust the politicians to keep the promises being made. A case can certainly be made for retaining the toll, but in this case, the politicians had a greater need to restore a little bit of credibility with the voters. Plus, the ongoing costs of GA 400 will still have to be paid. Then there will be an opportunity to screech about big bad gummint spending (which of course will be characterized as spent on something else). Atlanta has actually lost Federal highway dollars because of air quality standards. Cobb County is still one of the top recipients of Federal funding in the nation, just as it was when _TV_Nation_ lampooned it 18 years ago. Newt Gingrich is a soshulist! They should have learned from the master and refinanced those bonds in perpetuity. Ms. Snyder, you live in Washington. MYOFB. You know not much of what you speak of. As stated previously, the bonds were paid off and the toll was never intended to go forever. Every few years, our politicians lobby the citizens for additional taxes. “For our children. For our schools …” They call them temporary, yet they’re never withdrawn. And the administrators of the budgets funded by these taxes are never held responsible for managing them smarter. The answer is always “more money.” I will never, ever vote for additional taxes until these folks can prove that they’re top heavy management teams can do their jobs smarter. Getting relief from a tax, even this small, is a slight victory for the citizens of our area and a victory for the smart public leaders who, for once, are actually honoring a commitment. The road still needs annual maintenance. Without the tolls, which users of the road paid, the cost will be borne by all Georgians. This is a good reason to keep the toll in place, but perhaps change its price to match the actual expenditures now that the debt service is no longer being paid. I love these arguments on gas taxes and tolls. When people don’t like them going toward transit and bike/pedestrian infrastructure, they scream that gas taxes and tolls are “user fees” and should only be used to fund that infrastructure and that it’s not fair subsidize things they aren’t using. But when those user fees are falling short of paying for those roads and it’s suggested that tolls or gas taxes be raised, they scream that they don’t want any new taxes and that it isn’t fair to charge them more. Never mind that general tax dollars then have to be used to subsidize what they’re using. So which is it? A tax or a user fee? They promised this toll would go away after the bond was paid off. Fine. But tolls aren’t the same as taxes. You can’t have it both ways. Toll, tax usage fee… call it whatever you want. It all goes to the same black hole. The fact is the toll stayed in place for 2 years more than the original legislation called. If there’s a budget shortfall, go through the proper process to get the toll re-instated. Maybe try managing the budget a little better? No one ever holds the admins responsible any more. The waste and corruption that goes on in Atlanta is beyond comprehension. To blatantly lie and maintain a toll for longer than agreed is not acceptable in any way. We’ve come to accept any and all taxes as OK and that’s just silly and irresponsible on our part. Throw more money at it and it gets fixed. Yep. Great solution. No such thing as a temporary tax. 7% sales tax + 6% income tax here is ridiculous. Roswell and Alpharetta have their own bus systems? That’s news to me. Those 2 are indeed covered under Marta. However, Gwinnett and Cobb counties have their own bus systems which take the most torturous routes to provide service. And when Civic Center (I think) is basically your only major connection point the whole bus system is dramatically poor. As a college student with a job I had to suffer through several years of this. And Marta subway was almost certainly designed for the sole purpose of allowing norther suburbs to skip Atlanta when going to Hartsfield Jackson. What has made Marta marginally useful is growth in downtown and midtown. Additionally, townships like Atlantic Station which run free trolleys to and from Marta stations. The fundamental problem for Atlanta is that statewide funding decisions are largely driven by rural votes. Additionally, most rural voters hate the city of Atlanta (and amazingly seem to believe that it depends on them, when in reality, Atlanta pretty much supports the entire rest of the state). As a result Fulton county has to resort to what seemed like annual sales tax hikes to keep the city running. While removing the tolls on this route may have been the “right” thing to do, in reality it only hurts the city if Atlanta, because the money will have to come from somewhere else (ie disproportionately Atlanta citizens’ pockets) while the beneficiaries are disproportionately people who use these routes to travel in and out if the city. Unfortunately, this will hamper the urbanization of Atlanta. The tolls paid the bonds for the roadway. The drivers directly PAID for GA 400. Atlanta, of course, lobbied to keep the toll because it was a great way to punish those upstart “rich” people who fled Atlanta northward. Now GA 400 can be maintained the same way all other state roads are maintained.. through gas taxes and the general revenue funds. The people who drove that toll road daily, not only fully funded their own roadway but were paying for roads they never once drove upon. They were, in effect, doubly taxed for living north of Atlanta. How about a little basic fairness and making Atlanta and the rest of the metro area pay their “fair share”? I think you mean 9.25% sales tax. The toll is actually a big culprit in the traffic situation on 400. When its rush hour, I have to sit 15 minutes just to get to the tollbooth, which is worse than having to pay miniscule toll. I’m glad that they are removing it. Also, I find it ridiculous that a $0.50 toll is keeping 11,000 cars off of the road. If it was a $10 toll like on some bridges in NY, I could see the point. But anybody with a car who can pay for their gas will surely have enough money to pay for the toll on 400. They have MARTA, but it is useless. It would take one-quarter of the time to drive from Alpharetta to downtown Atlanta than it would to take public transit, and that’s DURING rush hour. Yes, you could drive down to the North Springs Station if you are going to midtown or downtown. However that is not faster either. I used to go to college in downtown Atlanta. It would take me 30 minutes to get downtown from the point I passed the North Springs Exit on my car. If I were to exit, park my car, and wait for the train to take me downtown, altogether it would take me 45 minutes from the point I got off the exit, to the point I arrived on GSU campus. The Atlanta Metro Area DOES have public transit. But is is so inefficient that it is practically useless. OK, so you neither own a car, nor live in Atlanta. Why, exactly, should anyone care about your opinion on this subject?? Yes, because I didn’t know these things about the author until AFTER I’d read the article; hence, my irritation at the waste of time. Since the closing of the GA 400 Toll, my commute has increased 15 to 30 minutes every day 50% to 100% increase in time to get home to my kids. This is utterly depressing. I moved in town (and pay higher taxes) to avoid heavy traffic. Drive for free? The people living North of Atlanta are the only ones who have actually paid for the road they drive on. If the GA DOT wants to make money, they can set up toll booths on the downtown connector and see how much money they rake in. Nobody forced you to have kids. I lived in Atlanta when 400 was originally built. The bond issue only passed because of the promise to remove the tolls once the bond was paid off. It was originally a 5 year bond, but was refinanced into a longer bond, several times. Because of poor language, they were able to use that to perpetuate the tolls. Nathan Deal was only standing up for what was originally promised. Incidentally, the only thing the original bond actually paid for was the toll booths and the collection infrastructure. Every penny of the GA-400 spur construction ended up being paid for by the taxpayer (federal funds). There was no real need to have the tolls in the first place except to raise funds for political pet projects. No toll funds were ever used for maintenance an upkeep of 400, as that was always paid for by the taxpayer. We easily take transit here in Atlanta…it’s called a car. I love the way the urban elitists took the “mass” out of “mass transit” to make it more palatable. I guess sitting in traffic is “palatable”? I wouldn’t know, cause my city is designed so that I never have to deal with it. You do you, though, Atlanta. Will Texas DOT Gouge Another Highway Through Dallas?